As TSO published; “Dave covers a few races for TSO when he’s not at the races doing his other job, spotting for Tony Kanaan in IndyCar and Gabby Chaves in Firestone Indy Lights. With 30 laps to go in the 97th Indianapolis 500, I stopped spotting for Tony Kanaan. While that is not 100% accurate, it’s pretty close. TK had his hands full during those last laps as his opponents made their challenging bids for the lead, but it was almost as if he knew what they were going to do. He obviously knew where they were and didn’t he need that information from his spotter. I shut up. Keeping the 11 car out of trouble was still my responsibility and despite the urge to watch the race, I had to concentrate to ensure the track was clear from Turn 4 to Turn 2. When the leaders disappeared from view halfway through Turn 2, I focused my binoculars on Turn 4 and awaited their return to my area of responsibility. The Turn 3 spotter covers from Turn 2 to Turn 4. Like any other race fan, I just wanted to watch the race unfold beneath my perch located high atop the roof of E Stand. More than once I had to tell myself, ‘just do your job, do your job.” I knew TK would do his job, just as the crew had done their job in the pits. Ryan Hunter-Reay’s spotter was standing near me and he saw the wasn’t saying about what his driver was doing. I think he shut up too. It was an epic dogfight and obviously, I’m glad my dog won. On Saturday night before the 500, I was sitting in the stands at Anderson (IN) Speedway waiting for the start of the Little 500. It would be my first Little 500 (I’ve always gone to the Night Before the 500 at IRP) and I would be spotting for five time Indianapolis 500 starter Jimmy Kite. When the start of the race was delayed due to weather, I was thinking, ‘what have I got myself into?’ I needed to be at the Speedway early the next morning for the most important race of the year. It was a 30 minute delay before Jimmy lined up in his starting position on Row 10. I called “green, green, green,” looked to Turn 1 for the inevitable first turn crash (which didn’t happen) only to look back to Turn 4 to see Jimmy hitting the car on his outside. The guy on the outside flipped, Jimmy tore a corner off his car, and the guy who hit Jimmy, sending him into the flipping driver on the outside, sailed away unscathed. Jimmy’s night was done and when the rain returned, so was everyone else. The crew was able to repair Jimmy’s car, and the Little 500 was completed on Sunday night. Jimmy finished 14th with former Indy Lights driver Geoff Dodge in his ear. Although he lives in Speedway, Geoff is racing the regular weekly Saturday night program at Knoxville, Iowa. About 7 years ago I bought a house at 21st and Auburn in Speedway, Indiana. I share a property line with the Indianapolis Motor Speedway (we back up to Lot 2). On race day I got up around 7 am. My first duty is to check on the yard to see how the parking is going. Based on years past, I know there are folks parked in the yard as early as 5:30 am. My daughter is my “property manager,” selling reserved spaces on Craigslist for 30 bucks a pop. She even purchases spots from the neighbors for 20, sells them on Craigslist for 30, and makes 8 bucks after PayPal takes their 2 dollar cut. Is this a great country or what? The neighbors are happy to sell their spaces, the parkers are happy with having a reserved space and we’ve no complaints. The system works well. I was in the garage by 9:30 or so and immediately checked on my two radios, one for communication with the driver and one for listening to race control and communicating with the crew. My crew radio was acting up and we changed some cables which made it better. It still wasn’t great. As it turned out, I never once had to communicate with the pits. TK ran out front for much of the first stint but that cost the team as he was one of the first to pit. The penalty for leading was at least one lap per stint. It was better to run second or third in another driver’s draft, saving fuel to stretch that stint an extra lap or two. During the first few stints drivers were seeing what they had, checking their cars and allowing their competitors into the lead in order to save fuel. The last two stints were flat out racing. When Dario crashed with two laps to go, the other spotters came over to congratulate me. At that point I had not assessed the situation and had not determined how long it would take to clean up the mess. Besides, the car had not crossed the finish line and we ALL know ANYTHING can happen. I high-fived and shook hands and while I can’t say it was surreal, it certainly was out of place. We hadn’t won anything yet. He crossed the finish line and it was official. I have been told if the tears don’t run down your cheeks, it’s not crying. I’d be lying if I told you my eyes didn’t well up. The photo session for the winning team is scheduled for 9 am Monday. The lines of photographers were in place well before the car arrived at the yard of bricks around 9:15. The sponsors went first, taking group photos, followed by team owners, family members and finally the entire KV Racing team. 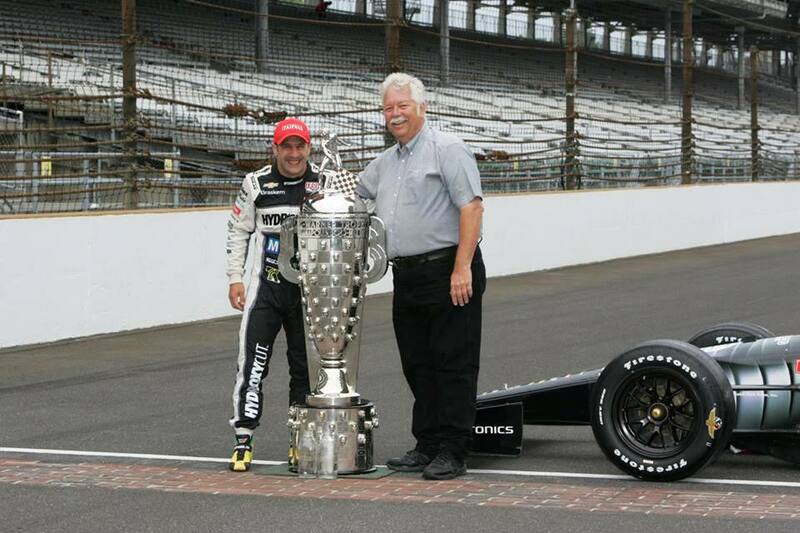 Group shots of the 11 crew were followed by individual shots of each crew member with TK and the Borg Warner Trophy. It is truly a memorable event. The photo session is important to me because of my love for the Speedway, its history and traditions. That’s why I missed the post race celebration at Sensu in downtown Indy. Sensu opens at 10 pm and I understand the birds were chirping when some made it home Monday morning. I didn’t realize Sensu opened at 10 until I tried to get in around 8:30. Instead I treated my sister, who was all dressed up for the occasion, to a shrimp cocktail at St. Elmos. My wife opted to stay home as my sister was pretty psyched to see her big brother win the Indy 500. Sensu was still closed when we returned a few minutes after 10 and we headed back to Auburn Street. When I left Virginia on May 9 I contemplated taking my clothes. You know, the clothes; the sport jacket, the tie, the nice trousers. But wouldn’t that be too presumptuous of me? Wouldn’t that jinx the team? I didn’t want to jinx the team. My wife took almost two hours. Despite the time, she went easy on the wallet, finding an outfit at the Kohls in Speedway. She even got new shoes. I had a pair of dress shoes at the Speedway house from an American Auto Racing Writers and Broadcasters Association (AARWBA) banquet, so I was set in that department. Finding a 52 long at Kohls wasn’t going to happen so we were off to the big and tall shop at Castleton Corner. I took one hour to shop but the dent in the wallet was bigger. Walking the red carpet took place at 5, followed by a dinner and then the awards presentation. After the banquet a quick return to reality was in order. I loaded my van for the long 10 hour drive back to Virginia. Done my midnight, I was on the road by 9:30 and back in Northern Virginia by 8:30 Tuesday evening, one day later than originally anticipated. During the awards presentation, Josef Newgarden talked about how hard he worked for nothing. He finished 28th on Sunday. The driver faces the most adversity when the car’s handling is off a bit. Struggling through a 500 mile race, or any race for that matter, makes for a long day. It’s the same for the crew. If the driver is mired in traffic the spotter’s job is more difficult. The pit crew struggles to find the right changes to make the car better and it’s a long day for everyone. The opposite is true. When everything is right, and it was for Tony Kanaan on that Sunday, the day is a breeze when compared to slogging around laps down to the leader. I’m not saying it’s easy to win the Indianapolis 500, far from it. The fact that the car was good from day one is a testament to the crew and their level of preparation for the race. KV Racing got it right. The pit stops were flawless. Everyone remained calm throughout the race and the entire event. With Tony running in the top five for most of the race my job as a spotter was made much easier. Copyright 2013 TrackSide Online — www.TrackSideOnline.com — All Rights Reserved.